Last weekend Mica had his friend party. His birthday was on August 10th. We decided to wait on his friend party because so many of his friend's moved from the directory we got when they were in Kindergarten. I figured we should let school start, so he could hand invites out. It worked out well waiting because my school starts at the same time as the boy's does. Hence I'm worn out, and my mind is all over the place that week before and week after. It's kind of hard because one of his best friends has has parents that are divorced. Mica handed her two invites - one for Mom, and one for Dad. Well Dad never passed one invite onto Mom. I called her a few days ahead of time to see if she got it? Nope! I wish that they would communicate better just for their daughter's sake. Beyond that I don't care if they get along, or not. I think for awhile the Mom thought we were on the Dad's side. It was just because our kids would play on the playground after school with their kids. Who was there to pick them up? Their Dad. We didn't choose to have a side. It's just that he happened to be there. I don't really want to be friends with the parents. I just want Mica to be able to play with his friend. We had pizza; since it was a Teenage Mutant Ninja Turtle party. 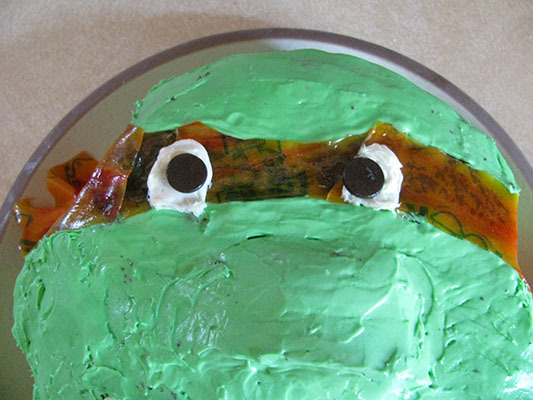 It is the turtle's favorite food after all. I cut up carrots and apples. Then we had fancy lemonade, in mason jars, with paper straws. I have got to get used to feeding the little guest less. My boys are skinny, and eat all the time! Other kids, not so much. 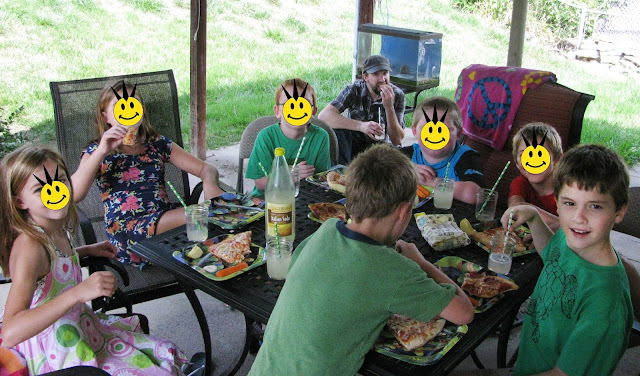 A few of Mica's friends have siblings a year apart, so we invited them to. One of the siblings didn't come, but her older sister did. I was ok with that. I had her put on the kid's fake tattoos. She helped with other things as well. I think she really likes us. 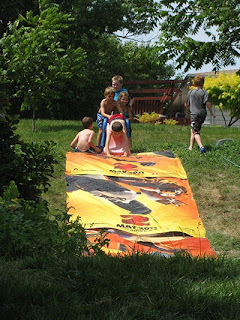 We set up the water slide AKA old movie posters. They had a whole lot of fun with that. 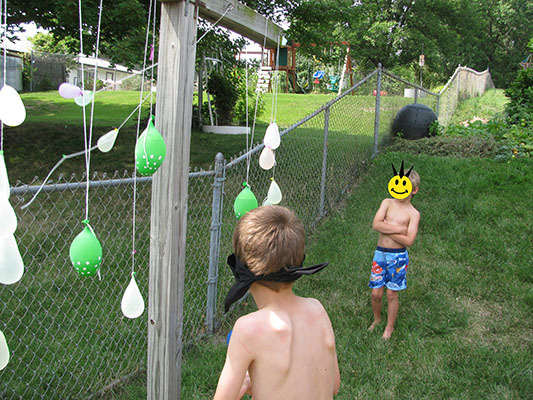 Then they did a water balloon Piñata. This was all pretty similar to Mica's party last year. New kids came, old kids didn't, so it worked out. I had Mica fill out thank you cards prior to the event. I just had him write, "Dear so and so, Thank you for coming to my party. I appreciate the blank. - Mica" Then I just wrote in what he got as he opened them. The thank you cards were dropped into their gift bags. Inside the gift bags they got a TMNT pen, a paper mask and animal crackers. I tried to stay as practical as possible. I'll have to think of something different for next year for Mica. Maybe repeat it for Isaak's party. It's pretty easy. We have a big back yard for them to run and play. That's a good idea about doing the thank you cards right then and there. I had my oldest fill out the cards after the party was over & then the little one just wrote in his name for his gifts. I bet all the kids think you have the coolest parties ever.... I think you do and I am sure as heck not a kid. Water pinatas sound like a blast! I have to agree. I don't want to be friends with my daughter's friends parents. But for some reason, every time we meet, I usually get a Facebook friend request and they want to chat all the time! I like the water slide from old movie poster. Looks like it was a fun party.